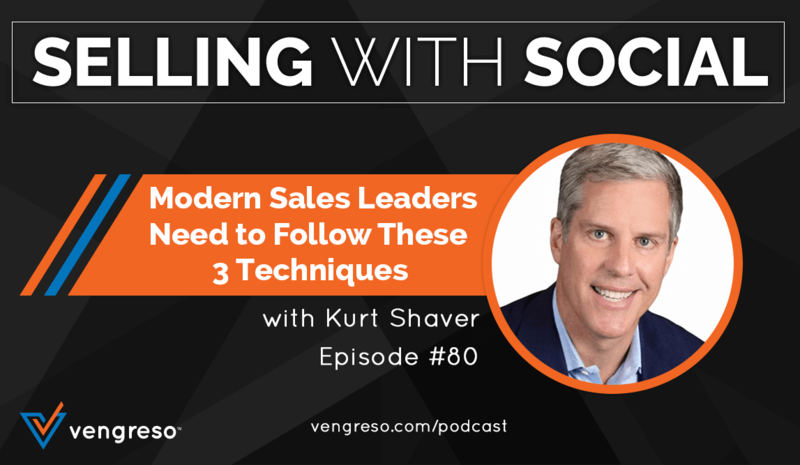 My guest for this episode of #SellingWithSocial is our very own modern sales expert, Kurt Shaver. Kurt is a co-founder and Chief Sales Officer of Vengreso. Throughout this podcast, he shares 3 main techniques that every sales leader needs to stay on top of in order to bring in more qualified leads and achieve better success in the B2B environment. His insights may change the way you view modern selling forever – be sure to listen. What Does it Mean to be a Modern Sales Leader? The key idea for modern sales leaders to understand is that they have to be adaptable. The modern selling environment is constantly shifting, and leaders must be able to help their teams meet their customers where they’re at. As a leader, you must also be skilled at helping your team engage clients with the content your company creates. For the full discussion on what it takes to be a modern leader, don’t miss this episode. One of the best ways modern sales professionals can add value to a buyer’s purchase journey is through sharing impactful content. Content that educates, inspires, and encourages people to action is still one of the greatest tools you have at your disposal. The internet has simply changed the way buyers find, learn and engage with content. It has shifted the power of accessing information about pricing, methodology, products and services into the hands of the buyer. The modern sales leader must understand that buyers are accessing this information on their own, most often before talking to a salesperson. The leader then must determine how they can enable their teams to reach these customers earlier on in their decision-making process. By working closely with their teams, a leader can greatly impact the way customers receive information about a company. The entire selling department within your company must be a modern selling environment because simply having a modern leader is not enough. A leader needs to have a great team underneath them in order to be most effective. In order to teach and train a team to be modern professionals, the sales leader himself must stay abreast of B2B selling trends, tools, and best practices. If your title has the word “sales” in it at all, then you MUST be bringing in at least one qualified lead into your pipeline per month. Without the regular practice of actually selling to modern buyers, you’ll lose the ability to connect with your team and help them achieve greater success. Leaders also need to be open to change and be passionately curious about new ways of selling. Becoming familiar with the tools your company uses, studying tech trends, and brushing up on your coaching skills are all essential techniques. When looking for new top talent, modern sales leaders need to understand that just as YOU are examining a prospective employee’s resume and LinkedIn profile, THEY are also looking right back at you. A prospective hire can control who they work for and which company they work for when searching for a new job, and they are looking to your online profiles to answer these 3 questions. Can you (the leader) help me get where I want to go? Are my superiors’ leadership styles and personalities going to fit with my own? Kurt explains hiring in this way, “If you’re a company looking for talent, you’re in a selling role!” Not only do your company’s profiles need to be optimized to attract top talent, your individual profiles need to address the answers to these 3 questions. If they look at your profile and can understand who you are, what you do, and how you can help them, they will be even more likely to accept a position with your company vs your competition. Kurt explains in great detail how leaders can refine their hiring process on this episode, and you don’t want to miss it. [5:27] What is a modern sales leader? [29:22] How can a leader improve their status on LinkedIn?